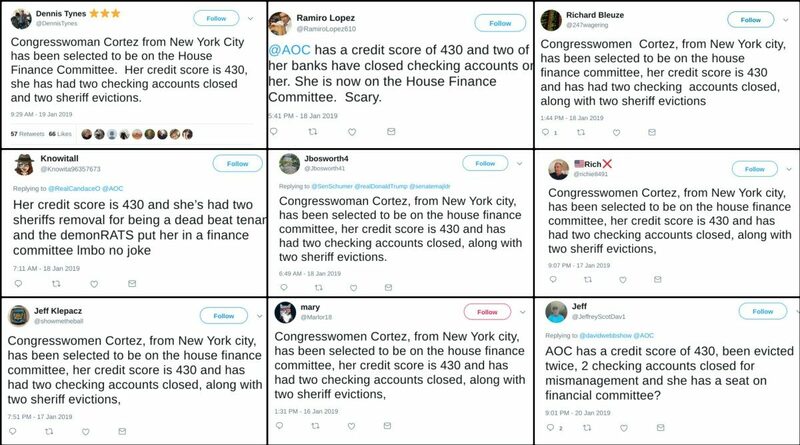 FACT CHECK: Does Rep. Ocasio-Cortez Have a Low Credit Score, Closed Checking Accounts, and a History of Evictions? You can claim anything you want if your audience is unconcerned with matters such as evidence. Repeating this claim over and over again, however, did not make it true. We encountered several dozen accounts spreading this rumor, yet not a single one pointed to any sort of news report, interview, financial record, witness statements, or anything else even slightly resembling evidence. 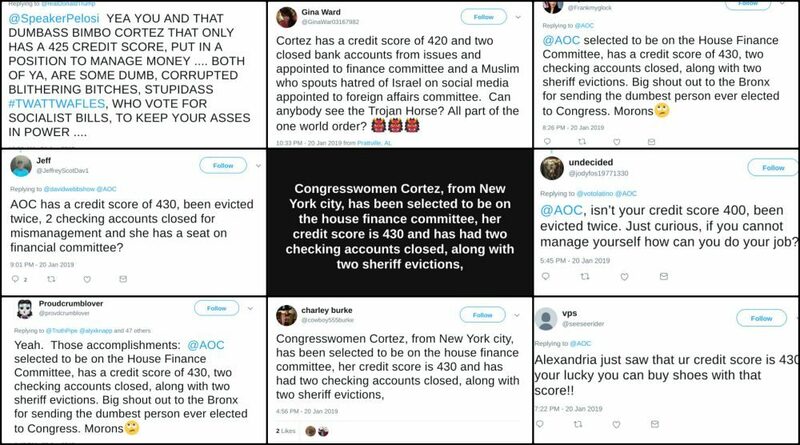 In addition to a lack of evidence, it should be noted that it is highly unlikely that Johnson, a security officer living in Florida, would have access to information regarding Ocasio-Cortez’s credit score, as this information cannot be obtained by a third party without written consent under the Fair Credit Reporting Act. Johnson claimed that Ocasio-Cortez had been evicted from her home twice with the help of a sheriff’s office. We did a background check on the congresswoman and found no mention of such an incident, no court cases tied to her living arrangements, and no irregularities in her housing history. She was a rising political star in 2018. As such, a number of news outlets published profiles about her that detailed Ocasio-Cortez’s upbringing, her education, and her political motivations. We examined several of these stories and also found no mention of her alleged “sheriff evictions,” closed bank accounts, or low credit score. She grew up in the Bronx and helped support her family after the death of her dad. Born in the Bronx, Ocasio-Cortez was raised by a mother from Puerto Rico and a father who was a small business owner. After her father passed away from cancer in 2008, Ocasio-Cortez worked two jobs in the restaurant industry to help her family make ends meet. After returning to the Bronx after college, Ocasio-Cortez pushed for greater childhood education and literacy, according to The New York Times. She also started a publishing company that produced books portraying the Bronx in a positive manner, The New York Daily News reported in 2012. Her upbringing also helped her foray into politics, she told Elite Daily. In general, we found nothing indicating financial irresponsibility in Ocasio-Cortez’s background, whose April 2018 Financial Disclosure Report detailed a modest amount of assets and income, but also no liabilities other than a federal student loan. We also note that low credit scores potentially attach not only to persons who have poor credit histories (i.e., numerous late or unpaid debts), but to those persons who simply have not built up their scores through means such as taking out credit-building loans and using credit cards. 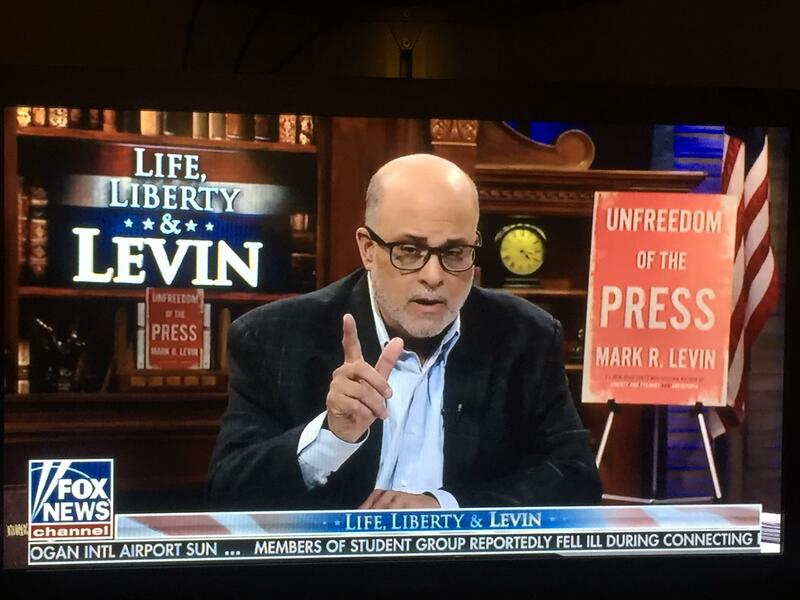 Mark Levin is on FIRE tonight over the corrupt Mueller report.